In October 2012 at a special press event in San Jose, Apple unveiled its 7.9-inch iPad after months of rumors. It was a busy event. Apple showed off a revised iMac, an updated Mac mini1 and the 13-inch MacBook Pro with Retina display. When it was time to talk about the iPad, Apple announced the 4th-generation iPad. The 3rd-generation model, complete with Retina display, had only been on the market since the spring, but reviewers and users complained that the device was slower than previous models, thanks to those extra pixels. The 4th-gen iPad came with a much more powerful SoC, but that's a story for a different time. The star of the show, at least for iOS users, was the mini. Inside, the iPad mini was an iPad 2, Apple's longest-running tablet. That meant the iPad mini was powered by the same Apple A5 processor and had the same 512 MB of RAM, all running iOS 6. It got the same 10 hours of battery life as other iPads, despite its small size, better cameras and the inclusion of LTE and 802.11n, neither of which were part of the iPad 2. That size was the real story, of course. The iPad mini packed the iPad 2's 1024 x 768 display into a much smaller screen, shrinking the traditional 9.7-inch panel down to 7.9 inches. This came with an increase in screen density of 163 PPI over the 132 PPI on the first two iPads. I believe the iPad Mini (or whatever it’s going to be called) uses the same display as the iPhone 3GS. So instead of cutting these sheets into 3.5-inch 480 × 320 displays for the iPhone 3GS, they’ll cut them into 7.85-inch 1024 × 768 displays for the smaller iPad. Same exact display technology, though -- display technology that Apple has been producing at scale ever since the original iPhone five years ago. These are displays Apple knows they can produce efficiently and in enormous quantities. All they have to do is cut them into bigger pieces. And then for developers, the iPad Mini acts just like an iPad 1 or 2: same number of pixels, just a little smaller physically. It’s not a new target. This was a very clever trick on Apple's part. It meant that 100% of existing iPad apps would work on the iPad mini from day one. In today's world, new iOS devices now often mean letterboxing around apps until they are updated, this transition was effortless for developers. The reduced size did mean that touch targets across iOS were physically smaller than on other iPads, but they were also exactly the same size as on the iPhone: 44 points. While the UI felt small compared to the full-sized iPad, in reality, it was exactly like using a larger iPhone display. iOS users were able to adjust quickly, and the worries about sanding down fingers quickly went away. When I unboxed the iPad mini, the screen turned me off right away. It’s less clear than the Retina iPad, and the pixels aren’t as close to the glass. However, I -- like most other reviewers -- have already grown accustomed to this step backward in quality. Yes, it’s not as good as the Retina display, but it’s also totally usable. I haven’t had to adjust the text size in any apps, and it doesn’t generate any eye strain, either. Don't get me wrong; I was ecstatic when the iPad mini was updated to include a Retina display, but it didn't cripple the original product. 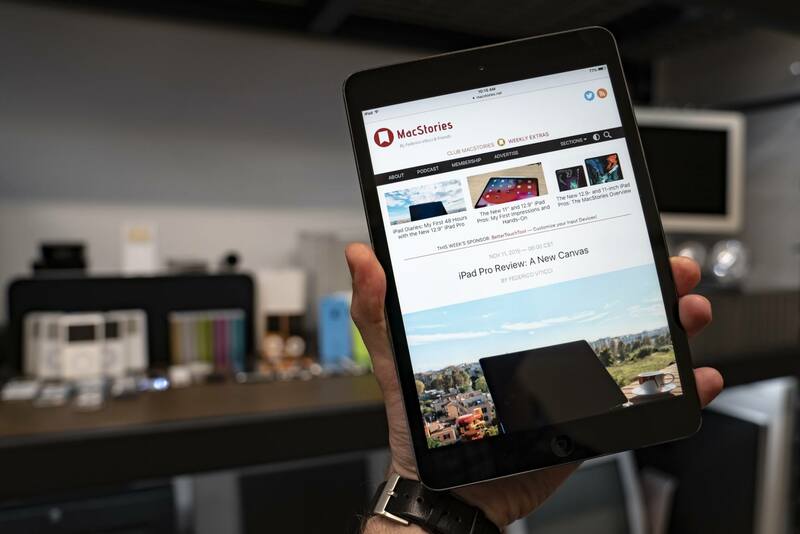 If you take an iPad and hold it upright in portrait view and draw an imaginary horizontal line halfway down the screen, the screens on the seven-inch tablets are a bit smaller than the bottom half of the iPad display. This size isn't sufficient to create great tablet apps in our opinion. Well, one could increase the resolution of the display to make up for some of the difference. It is meaningless, unless your tablet also includes sandpaper, so that the user can sand down their fingers to around one-quarter of the present size. Apple's done extensive user-testing on touch interfaces over many years, and we really understand this stuff. There are clear limits of how close you can physically place elements on a touch screen before users cannot reliably tap, flick, or pinch them. This is one of the key reasons we think the 10-inch screen size is the minimum size required to create great tablet apps. Granted, the iPad mini shipped after Jobs' death, but I don't think Tim Cook was eagerly waiting that day to ship a smaller tablet, and I think the keynote proves it. During the event, Apple compared its 7.9-inch screen to the 7-inch panel found on things like the Nexus 7, a popular Android tablet at the time. Apple mocked the Nexus 7's build quality and construction before comparing the 7 and 7.8-inch screens in the products. 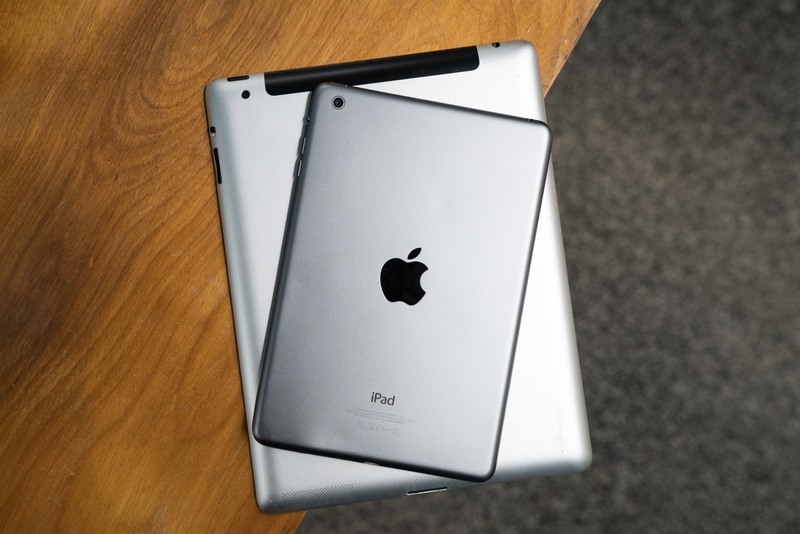 The iPad mini's screen was over a third larger than those found on 7-inch tablets. This meant content was easier to see, showing much more of a webpage or a making a video larger and clearer. Coupled with the fact that most Android tablet apps at the time were just stretched out phone apps, the iPad really shined brightly in the keynote. 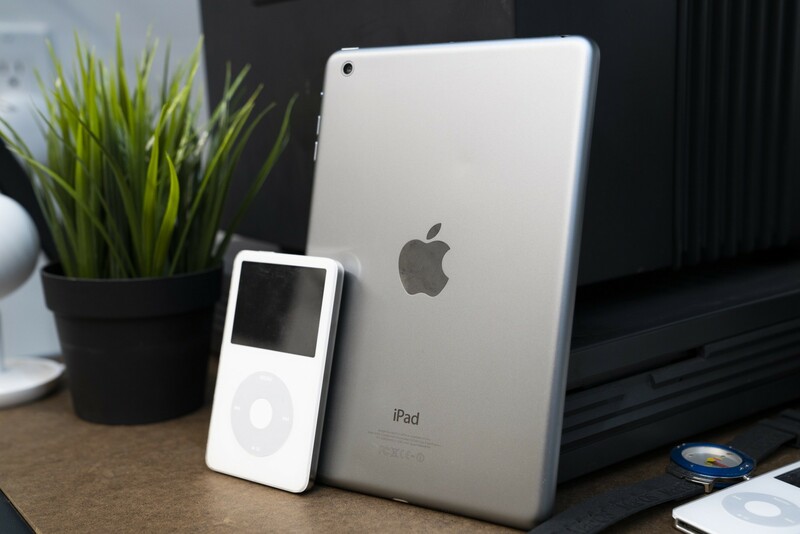 The iPad mini ushered in a new design language for the iPad and one that would spread to later devices like the iPad Air and the first two generations of iPad Pro. It featured rounded edges that met the screen via iPhone 5-like chamfered edges. The plastic volume rocker was replaced with discrete aluminum buttons. The mute/rotation lock switch3 was also made of metal. The new Lightning port was flanked by stereo speakers, a first for an iOS device. Like today, the speakers were located behind laser-cut holes in the aluminum case. The bezels along the long sides of the display were far narrower for easier one-handed use. Despite this, the device felt rigid and strong, thanks to Apple's unibody construction methods. In short, everything felt far more premium than before. The iPad mini was available in two colors: Silver and Slate. The latter is not unlike the dark iPhone 5, a finish that Apple hasn't returned too in our era of Space Gray. It started at $329 for a Wi-Fi model with 16 GB of storage, the lowest price an iPad had been offered for at the time. The iPad 2 remained for sale at $399, with the then-new iPad 4 starting at $499. Customers could get up to 64 GB of storage on an iPad mini, if they wanted to $529 for Wi-Fi, or $659 for a cellular model. The tagline for iPad mini was "Every Inch an iPad," and I think Apple delivered on that promise. The iPad mini made the iPad far more portable, opening up new use cases at work, home and beyond. For years, it sat nicely between the iPhone and iPad lines in size and weight, as it weighed in at just .68 pounds. Most importantly, it was a seamless experience of third-party developers, meaning the rich world of iPad apps were all just a tap or two away in the App Store. Today, the iPad mini feels a little forgotten. The iPad has fallen in price, now starting at the mini's original price point of $329. The iPad mini 4, powered by the Apple A8, was announced in September 2016 and is offered at $399 for 128 GB of storage. It lacks almost all modern iPad features, but recent rumors say a new model could arrive next year. As iPhones have gotten bigger and the entry-level iPad has become more capable, the iPad mini has been squeezed on both sides. Does it still have enough ground to deserve a refresh in 2019? I think it does, but I'm not holding my breath, either.